Navy Explosive Ordnance Disposal Technicians render safe all types of ordnance, both conventional and unconventional, improvised, chemical, biological, and nuclear. They perform underwater location, identification, render safe, and recovery (or disposal) of foreign and domestic ordnance. 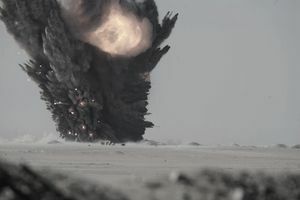 They conduct demolition of hazardous munitions, pyrotechnics, and retrograde explosives using detonation and burning techniques. They are also called upon to support military and civilian law enforcement agencies. Explosive Ordnance Disposal Technicians locate, identify, render safe, and dispose of all forms of ordnance (conventional, nuclear, chemical and biological, military and improvised) both U.S. and foreign made. Parachute or helicopter insertion and deep-sea diving capabilities are sometimes necessary to perform this mission. In addition to working closely with other military services, EOD technicians occasionally assist civilian law enforcement agencies. EOD technicians perform duties in a wide range of locations, such as at remote areas, aboard aircraft carriers, at ordnance-capable military stations, and in all water conditions. They are exposed to various climates and weather conditions. Their missions take them to all environments, every climate, in every part of the world. Navy EOD Technicians have many assets available to arrive in their mission, from closed-circuit scuba and surface-supplied diving rigs to parachuting and insertion from fixed and rotary aircraft, to small boats and tracked vehicles. These highly trained individuals comprise approximately 0.2% of the Navy. EOD Technicians operate on five- to 12-person teams. Missions vary widely and cover the entire world in every ocean and sea. Note: Candidates may also volunteer for EOD during basic training at Recruit Training Center, at "A" school, or at any time during their enlistment prior to their 31st birthday. In-service recruiters (Dive Motivators) at RTC give presentations on the Navy's diver programs, conduct the physical training screening tests, and assist interested people with their applications. People who enter the Navy in the nuclear, advanced electronics or other five- or six-year enlistment programs are not eligible for diver programs. This course is physically and mentally demanding, but the individual who accepts the challenges is rewarded with extra pay for diving, parachuting, and demolition plus extraordinary duty assignments. EOD is a sea-intensive community. Manning conditions at sea may require the need to request sea tour extension or shore tour curtailments to ensure all sea duty billets are filled. Much of the above information courtesy of the Navy Personnel Command. Want A Career In Marine Explosive Ordnance Disposal? What Does a Navy Intelligence Specialist Do?